you are in medium to large scale business that involves huge and expensive power and cooling solutions you must have come across the need to cut down on running costs incurred by these existing solutions. For your business to prosper, investing in APC by Schneider electric’s InfraStruXure is necessary as it not only eliminates capacity and other hurdles but it can be designed to fit a company’s requirements and adapt to its future business needs that may arise. 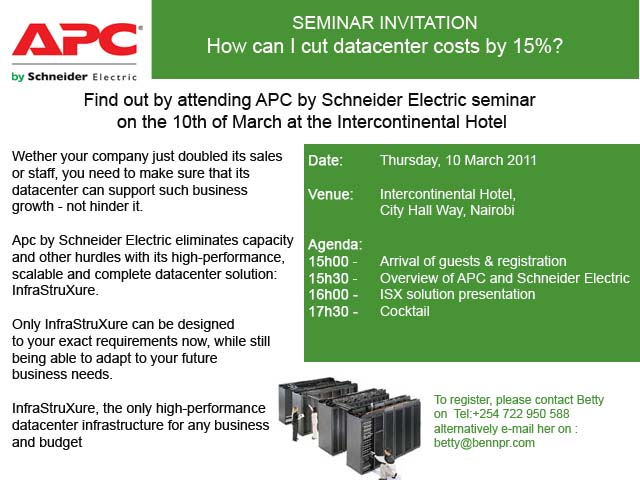 Find out how APC by Schneider electric, global leader in power and cooling solutions can assist your IT department cut running costs with its high performance complete Data center solution InfraStruXure by attending a seminar by APC at the Intercontinental Hotel on the 10th of March. The event is scheduled to start at 3 pm where there will be a presentation on the ISX solution.